“The Supremes have seemingly – I agree with Andy McCarthy on this – seemingly conferred upon a class of individuals around the planet who can claim that they have some bona fide relationship with people in the United States, people or institutions – they’ve got family members here, they’ve got some kind of gig going with a university, speaking there, attending it, what have you – which essentially creates an opportunity for people who may be dangerous to us nonetheless to litigate their way into the United States,” Gaffney said, referring to a point raised by former prosecutor and National Review columnist Andrew McCarthy about the exceptions to the Supreme Court’s general approval of the Trump immigration order. “I think it’s a serious mistake that may be revisited when the court gets around to this in terms of addressing the merits in the fall,” said Gaffney. “The main thing is, I believe, that the Supreme Court did very importantly affirm that it is in fact a presidential responsibility to determine the eligibility of people to come into the United States. That’s essentially what President Trump has said he would do, has tried to do with these orders – two of them now – and I think that affirmation is absolutely critical,” he said. “We’ll see how it plays out. I hope especially, speaking to your point about extreme vetting as the President called it, that one of the things that will now be possible is for the president to do what he said, I think most articulately in Youngstown, Ohio on the 15th of August last year. And that is to establish that people who don’t share our values are not going to be admitted into this country,” Gaffney told Marlow. “They have no right to come here – including, I would argue, these people that have some bona fide relationship with people here. They certainly shouldn’t be coming here if, in fact, they intend to impose their values on us, especially violently. 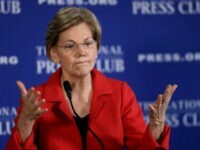 That’s of course true of these sharia supremacists, most especially,” he said. “This is an important step by the Court. I hope that it will be affirmed and built upon, both by the president and by the Supremes when they come back to it in the fall,” Gaffney said. 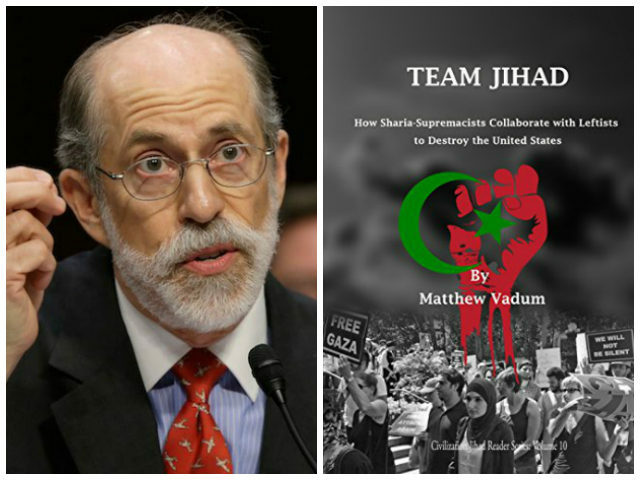 Gaffney was excited to announce the release of the Center for Security Policy’s latest ebook, Team JIHAD: How Sharia Supremacists Collaborate with Leftists to Destroy the United States. “We unveiled it yesterday with a Facebook Live event featuring Matt Vadim, the author of the book, and also Gregory Angelo from the Log Cabin Republicans, talking about basically this phenomenon, the bizarre phenomenon of the hard left in the United States making common cause with – excusing, apologizing for, or otherwise enabling – the jihadists,” said Gaffney. He said leftists were willing to excuse some degree of violent jihad, but they were especially relaxed about “civilizational jihad,” the “stealthy, subversive” approach favored by such organizations as the Muslim Brotherhood. Marlow asked about “Ramadan rage,” the wave of violence characteristic of Islam’s major holiday, noting that Ramadan 2017 was roughly three times more deadly as the previous year. “We should be clear: you have some of the violent jihadists, notably the Islamic State, who called on people to use the month of Ramadan as an opportunity to go act on it, and murderously so, and they did,” he added. “The other piece of it though, and I cannot emphasize this enough, I think is that what we’re witnessing, both in terms of these growing appetites – if I can use that expression – on the part of the jihadists for violence, and their perception that the time has arrived in which to engage in it, because of what they are perceiving as essentially the submission of Western governments,” Gaffney argued. Gaffney pointed to a report by Robert Spencer of Jihad Watch about “a civil war now under way in Sweden.” As Marlow later noted, the dire warnings about Sweden are coming not from outside observers, but from the Swedish police themselves, who are literally begging for help with controlling the situation. Marlow described the Swedish crisis as a failure of multiculturalist dogma. “Look, I have the feeling that people who are enamored of this globalist agenda, certainly that favored by the elite – that really America is not exceptional, that really America is just another nation, that really America just needs to find its place among the other nations and behave itself as dictated to it by the other nations, notably through the U.N. and the like – are going to find any opportunity to revile this president who simply has a very different, I would argue much more traditional American attitude towards both what this country is, its role in the world, and how it should conduct itself,” he said. “I think the measure is not on how public sentiment here, or for that matter abroad, is playing so much as is it consistent with our long-term national security interests to be told that we can only do this, or only do that, or not do this, or not do that by some international community and its norms, rather than by our own national polity and interests,” Gaffney contended. 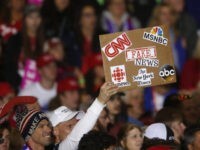 “This is the moment where I think the course correction that Donald Trump promised us is both so welcome and so needed, because clearly we have been getting into a fix, I think most especially under Barack Obama, from which it was going to be very, very, very difficult and very, very, very dangerous to extricate ourselves – including in the piece that we were just talking about, Alex, the accommodation and ultimately submission to this global jihad movement,” he said. Breitbart News Daily airs on SiriusXM Patriot 125 weekdays from 6:00 a.m. to 9:00 a.m. Eastern.